New Orleans Voodoo, describes a set of spiritual folkways which originated from the traditions of the African diaspora. It is a cultural form of the Afro-American religions which developed within the French, Spanish, and Creole speaking African American population of the U.S. state of Louisiana. Voodoo is one of many incarnations of African-based spiritual folkways rooted in West African Dahomeyan Vodun. Voodoo became syncretized with the Catholicism and Francophone (French speaking) culture of south Louisiana as a result of the slave trade. 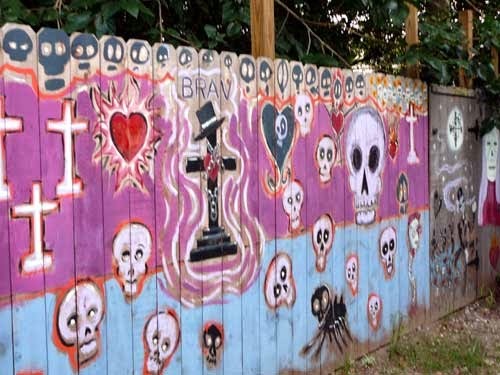 Louisiana Voodoo is often confused with—but is not completely separable from—Haitian Vodou. It differs from Vodou in its emphasis upon Gris-gris, voodoo queens, use of Hoodoo occult paraphernalia, and Li Grand Zombi (snake deity). It was through Louisiana Voodoo that such terms as gris-gris (a Wolof term) and voodoo dolls were introduced into the American lexicon. Gnosticism (from gnostikos, "learned", from Ancient Greek: γνῶσις gnōsis, knowledge) describes a collection of ancient religions that taught that people should shun the material world created by the demiurge (deranged demigod) and embrace the spiritual world. Gnostic ideas influenced many ancient religions that teach that gnosis (variously interpreted as knowledge, enlightenment, salvation, emancipation or 'oneness with God') may be reached by practicing philanthropy and diligently searching for wisdom by helping others. Gnosticism itself is believed (by some) to have come from northern Africa, via the Egyptian Mystery Schools. In this regard, Voodoo’s Xian-imposed overlay may also be African in origin. Even though the descendants of West Africans concealed their cosmology in a thin Christian veil, they were honoring and utilizing the old, African gods… gods that had found their way via Egypt and Syria, into Xtian teachings. Again, parallels between Gnosticism and New Orleans Voodoo are multifaceted. Within Gnostic cosmology, the serpent in the Garden of Eden is a heroic, salvific figure rather than an adversary of humanity or a proto-Satan. The serpent represented ancient understanding and the apple represented specific knowledge. Accordingly, eating the fruit of Knowledge is the first act of human salvation from cruel, oppressive powers. 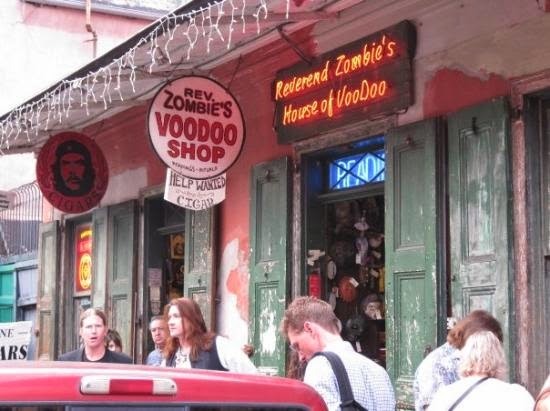 Among New Orleans Voodooists, Li Grande Zombi (also called Damballah Wedo) is the major serpent spirit of worship. Within the Voodoo cosmology, snakes are not seen as symbols of evil as in the (traditional) story of Adam and Eve. 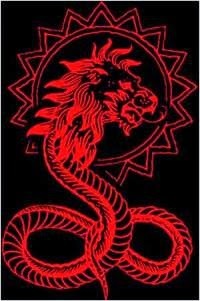 Snakes are considered to be the holders of intuitive knowledge… knowing that which cannot be spoken. The origin of Li Grande Zombi can be traced to the serpent deity Nzambi (a creator god) from Whydah in Africa. In this regard, the Gnostic symbol for universe, the ouroboros (the serpent biting its own tail) is roughly equivalent to the serpent creator god, Nzambi and by extension, Li Grande Zombi. Central to the Gnostic cosmology is the understanding that there is a true, transcendent and “unknowable” God, who is beyond all created universes. Intermediate deific beings known as Aeons, exist between the ultimate God and manifest universe. What we perceive as the material universe was created by a deranged deity known as the Demiurge or, more recently known as… Jehovah. Jehovah was in turn surreptitiously created by one of the Aeons, known as Sophia (wisdom). Thus our universe is “administered” by a deranged deity, whose minions (Archons) intercede with humanity. Closely related to New Orleans Voodoo is the sister cosmology, Haitian Vodou. Voudouists believe in a distant and unknowable creator god, Bondye (likely derived from the French language term Bon Dieu, or Good Lord). 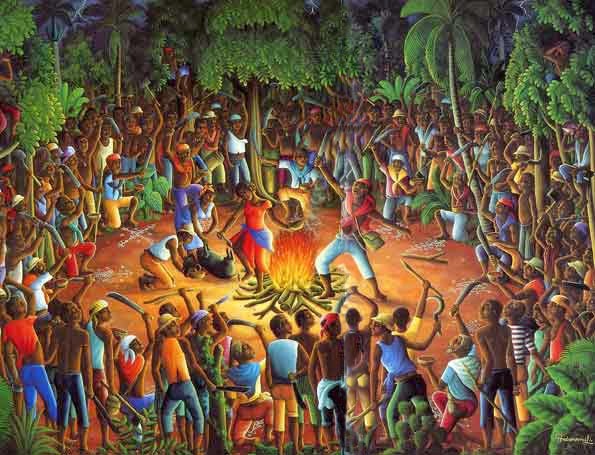 As Bondye does not intercede in human affairs, vodou practitioners direct their worship toward spirits subservient to Bondye. These spirit minions are known as Loa. The Loa “administer” specific aspects of daily life, and routinely interact with humanity. In order to navigate daily life, vodouists cultivate personal relationships with specific Loa, through the presentation of offerings and the creation of personal altars and/or devotional objects. The Xtian Jehovah had at his disposal, his underling Archons… more recently referred to as angels and demons. These lesser deities intercede in the affairs of humanity. Voodoo too has a pantheon of lesser spirits… the Loa. Like angels and demons, Loa can intercede with humanity, either positively or negatively. Unlike saints or angels however, they are not simply prayed to, they are served. They are each distinct beings with their own personal likes and dislikes, distinct sacred rhythms, songs, dances, ritual symbols, and special modes of service. Contrary to popular belief, the loa are not deities in and of themselves; they are intermediaries… for a distant Bondye. Consequently, Voodoo practitioners seek to actively influence the good will and assistance of the Loa. 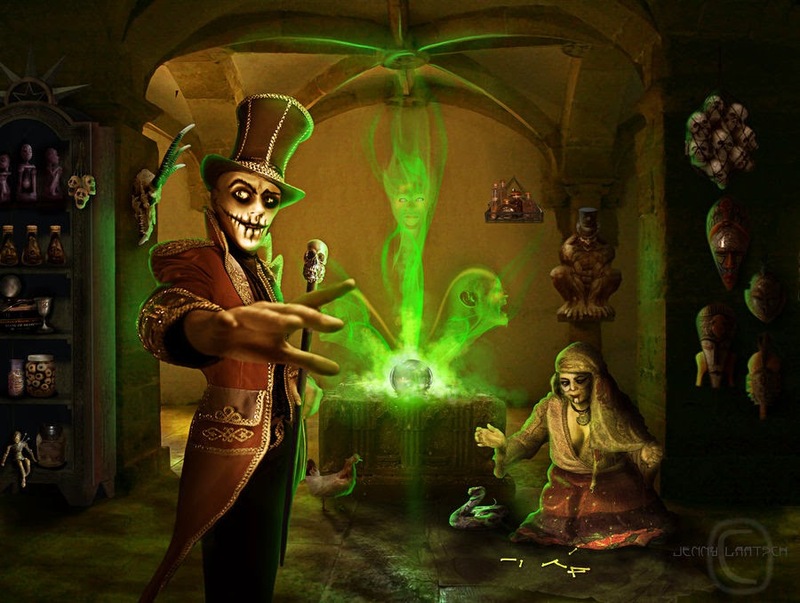 One major Loa within the Voodoo pantheon… he who serves as the intermediary between humanity and Bondye, as well as all the other Loa is: Papa Legba. As master of roads and pathways, Legba stands at the crossroads of the spirit world. He is the first and last spirit invoked during ceremony, as he is also master of communication and understanding… he opens and closes the doorway between realms. As the Loa of the crossroads, Legba’s symbol is the cross. Legba’s corresponding figure from the ancient Xtian world is, of course, Saint Peter. Peter stands at the “Pearly Gates,” passing judgment and granting passage to those souls found to be worthy. Peter is considered the keeper of the keys to the kingdom of heaven. So it is that Peter and Legba stand at the crossroads… at the doorway or gate between the realm of the spirits and the realm of the living. Both Voodoo and Gnosticism share the view of a distant and unknowable Godhead. The world of God is eternal and not part of the physical. It is impalpable, and time doesn't exist there. To rise to God, practitioners of Voodoo and Gnosticism must reach the knowledge, which mixes philosophy, metaphysics, curiosity, culture, gnosis (knowledge), and the secrets of history and the universe. The secret of both Voodoo and Gnosticism is that, in the grand scheme of universe, God can’t be bothered by the “goings on” of puny humans. God leaves the details of the material world, and that Podunk, backwater outpost known as “Earth” to underlings. These rascally underlings, be they Loa or the Demiurge, either help or hinder… based upon their whim. 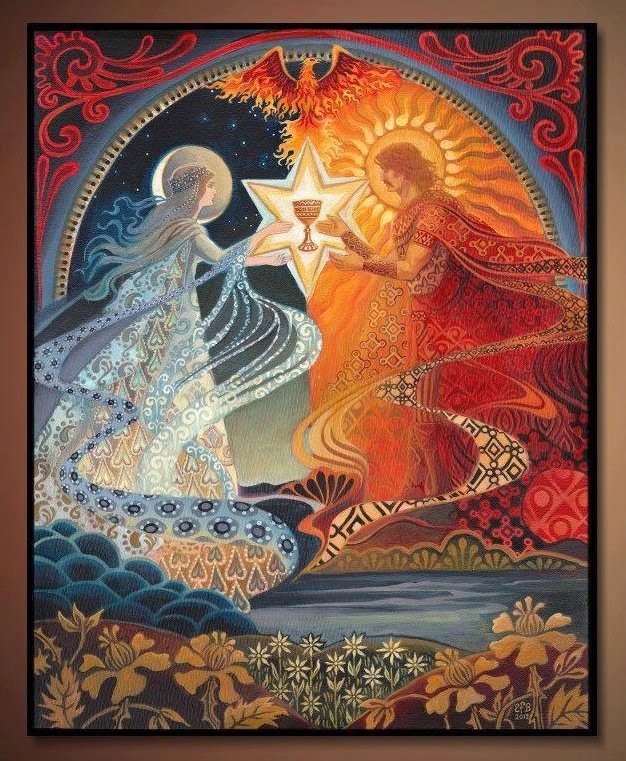 The deeper secret is this: on one level, humanity “doesn’t amount to a hill of beans” …but on another level, the spark or the soul of each human is divine, or able to connect with godhead. This is where the small meets the large… where the micro meets the macro… where the snake bites it’s tale. This is the secret of the old hermetic adage… as above, so below. Voodoo & the Digital Realm ~ Voodoo @ Mardi Gras!